Dubai-UAE: 26 December 2018 — LG Electronics (LG) is set to unveil its second-generation CineBeam Laser 4K projector (model HU85L) with Ultra Short Throw (UST) technology at CES 2019. This CES 2019 Innovation Award winner builds upon the success of LG’s first 4K projector (model HU80K) and continues to stand out from the crowd with its minimal space requirement and compact design that can project stunningly sharp 4K images on practically any flat surface – a wall, floor or ceiling. Delivering 2,500 ANSI lumens and 4K UHD resolution, LG CineBeam Laser 4K ensures exceptionally bright and clear images and superb black level, enhancing the viewer’s sense of immersion. LG model HU85L can reproduce highly accurate colors courtesy of its wide color gamut, which further increases the realism of every picture displayed. 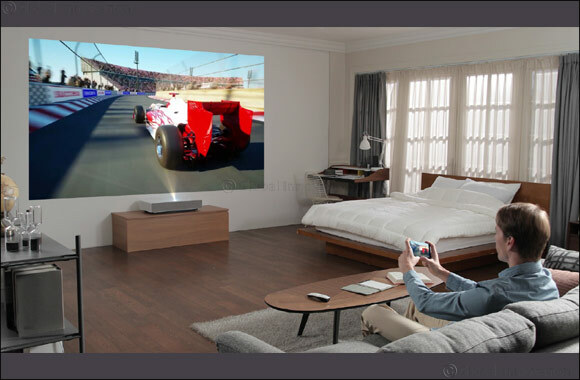 LG’s projector also provides plenty of content options, enabling users to stream movies and shows from their favorite services while USB, Ethernet and HDMI provide more connectivity choices. Extremely compact, the projector can be easily moved and adjusted for any environment, saving time in order to get right down to the business of viewing. The LG CineBeam Laser 4K is smaller than other leading 4K projectors and has a subtle design that won’t distract or interfere with the viewing experience – and makes the LG HU85L an attractive addition to any space. The advanced projector offers enhanced visual accuracy with a 12-point keystone adjustment feature, eliminating the image distortion that often affects other UST projectors.